The Miami View PTA has partnered with the Mayflower Arts Center to host a series of painting events for adults and kids. The events are open to the community for participation. Proceeds from each of the monthly painting events will benefit the Miami View PTA Playground Upgrade Project. Light refreshments will be provided. If you are interested in scheduling a private paint party or FUNdraiser, please contact Lisa Bauer by email or by calling 937-552-5848. And the winner of the Kids Choice painting is... FLYING PIG! 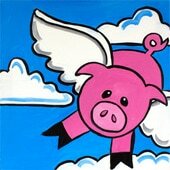 Miami View students will have a blast painting this winged, pink piggly-wiggly on a 12x12 canvas. Guided instruction takes them through each step so they can relax and paint with confidence. Light refreshments will be served. Proceeds benefit the MV-PTA. Thank you! ​To register, contact Kate Moore by email. Payment due by night of the event, cash or check made payable to Miami View PTA. 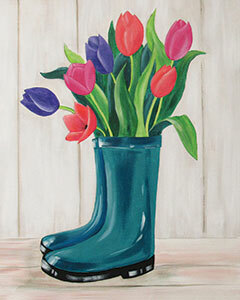 Spring showers would be a lot more fun if you had these rain boots to wear. Customize the boot design and tulip color to match your decor. No painting experience required. Guided instruction walks you through every step of the project, so you can paint with confidence.